Is your glass half empty of half full? Do you see the rain, or get excited about the oncoming rainbow? We all live in the same material world, but we experience it very differently. How we view an experience depends on the lens through which we are seeing it. That lens is created by previous experience, and how we have interpreted and processed that previous experience. Your brain has to handle an estimated 60,000 + thoughts every day. The conscious brain cannot possibly handle all that, so there are filters operating in the brain that show us certain information. Much like the Facebook algorithm, it shows us what it thinks we want and need to see, and tries to stop us seeing things that will challenge our world view. This is brilliant news, because it means that if you don’t like your current reality, you can change it by changing how you view it. One of the most effective ways to start to retrain the brain is by developing a gratitude practice, and living with an attitude of gratitude. Much research has been done into the benefits gained from developing a gratitude practice and living a life of genuine gratitude. This goes beyond merely thanking people for gifts and favours, but is about being profoundly grateful for everything you have in your life. It is very much connected to the Niyama of Santosha, which is contentment, that sense of being able to accept all that is happening, not seeing things as good or bad, just just as things that happen. When you live with an attitude of gratitude, you are able to look for, and find, the gifts and lessons in all things that happen to you. I am currently teaching my youngest son about the power of gratitude, by showing him that his presence in my life makes the difficulties of my relationship with his father totally worthwhile, he is my gift and I express daily gratitude for him. He now reminds me of this whenever I find myself complaining about circumstances that might arise! A gratitude practice allows you to celebrate the small wins and appreciate your efforts and progress. Instead of looking at the tasks you still have to do, you can reflect on what you have done and really appreciate the small steps rather than the journey still ahead. When you are able to find things to be grateful for on a daily basis, you naturally become happier, and soon become more optimistic as you anticipate that the world will provide you with more reasons to be grateful. This will be the case, as your brain’s ‘algorithm’ will mean that you notice more ‘reasons to be cheerful’! 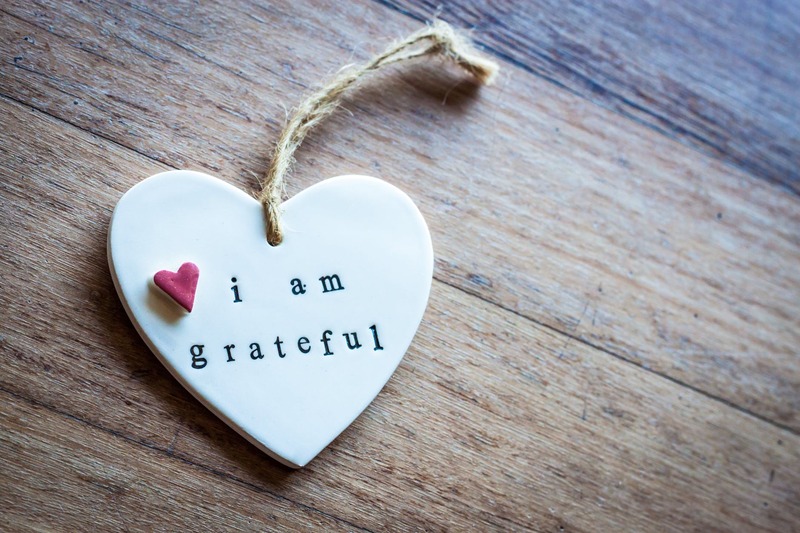 Research has found that people who practice gratitude have considerably improved physical health, from less frequent doctor visits to improved heart health, reduced stress, improved immunity and adopted healthier diets. Resilience is the ability to bounce back after illness, disappointment, loss or disaster. It seems obvious, then, that if the brain is wired to look for the gifts in any situation, then you will find it easier to spring back from the knocks life throws at you. Part of an effective gratitude practice includes not only looking at the things that have happened to you, but the things you have done, the person you are, the body you have etc. If you make sure that part of your gratitude involves being grateful for yourself, then you can boost your self esteem, and curb the negative self talk you might be subjecting yourself to.